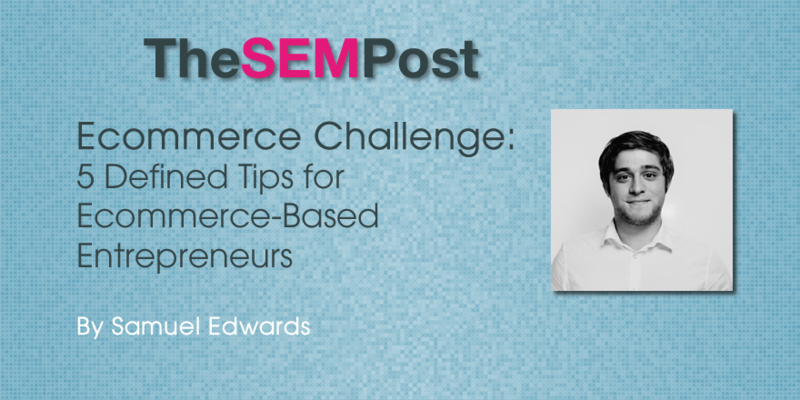 Building a business is challenging for anyone, but it can be even more challenging when it’s ecommerce-based. Ecommerce is an exploding market that’s worth getting into, but without a proper understanding of some of the fundamental tips and tricks for making your ecommerce business flourish, it’s easy for those businesses to flop. In fact, according to Practical Ecommerce, approximately 80 percent of ecommerce businesses fail, and that number isn’t getting any better in the near future. That statistic makes it more important than ever to understand successful ecommerce best practices, and that means going back to the basics. Here are five tips aspiring ecommerce businesses need to keep up in the online business world. The Internet makes competition in every market fierce. There are likely hundreds, even thousands of stores out there selling the same thing as you. So how do you stand out? By defining your specific niche. Jason Wei, Co-Founder of the Los Angeles-based start-up Taggler says it best, “Essentially, you need something unique to your ecommerce business, whether it’s free two-day shipping like Amazon or unlimited streaming videos like Netflix. These businesses are not the only ones who offer these features, but they were the first to deliver a successful platform that did so, and have become unbeatable in their trade as a result.” The secret to making it big in ecommerce isn’t so much selling unique things; it’s in offering unique and incredibly appealing features within your business structure. Obviously, you’ll need to define your audience, but besides determining if you’re selling to teens or the elderly, you’ll also want to think geographically, specifically whether you want to sell nationally or globally. It may seem like everyone should shoot for a global audience, since global means bigger, but that’s not necessarily true. Some businesses aren’t meant to go global at the outset, but may develop into a global business over time. Oftentimes, the best way to attract global customers is to focus on marketing specifically to your nation, becoming extremely popular, and then letting the global market come to you. Essentially, beginning a business takes two fundamental things: a logical aim and capital. In order to stay focused in both your main goal and your spending, you need a well-documented business plan, just like any other business. When writing a business plan, it’s important to keep it simple, and one of the best ways you can do that is to break it up into mini-plans to help you achieve different parts of your main goal. Once you’ve developed a solid plan, have it approved by advisers and consultants who have been where you are and succeeded in the market. These advisers can give you sound business advice to stop you from making major mistakes and help you get a leg up in the ecommerce world. As mentioned earlier, you can’t run a business without capital, and if that capital isn’t tightly reined in, you’ll struggle to stay afloat. It’s important to begin your business by being lean in your spending, and only shelling out real money when absolutely necessary. There’s no need to purchase top of the line equipment or giant office space at the beginning. Allocate your spending instead towards online marketing and product or service development rather than unnecessary features. Cut costs wherever possible and keep a reserve fund in case of emergencies, so if you have a rough few months, you’ll have a cushion until business gets going again. Despite varying opinions on the best way to go about it, no one will deny that practicing search engine optimization (SEO) drives rankings and conversions and is an important part of any ecommerce strategy. Success in an ecommerce business revolves around consumers being able to find your business, and SEO is the best way to get your company and advertisements at the top of the search results where they can be seen and clicked on. Understanding SEO best practices is one important step that should not be overlooked. If you want to be successful in the ecommerce realm, sometimes it’s a simple matter of going back to the basics and getting them right in your business plan. In my 4+ years as a digital marketing specialist, I have learned the ins and outs of online marketing. I have worked with countless local businesses as well as enterprise Fortune 500 companies and organizations including: NASDAQ OMX, eBay, Duncan Hines, Drew Barrymore, Washington, DC based law firm Price Benowitz LLP and human rights organization Amnesty International. Additionally, I am a recurring speaker at the Search Marketing Expo conference series. Today I continue to work with and establish SEO, PPC and SEM campaigns across all verticals.